If you can walk, you can tango . . . . . . Tango is a dance of seduction. It is a dance between a man, a woman and the music. It is a romantic, mysterious and passionate dance that speaks to the soul. Whether it is the embrace, the music, the movement, the sensuous walk, the syncopations, the sweeping rhythm changes, or the breathless pauses, each three minute dance can suspend time and feel like an eternity. 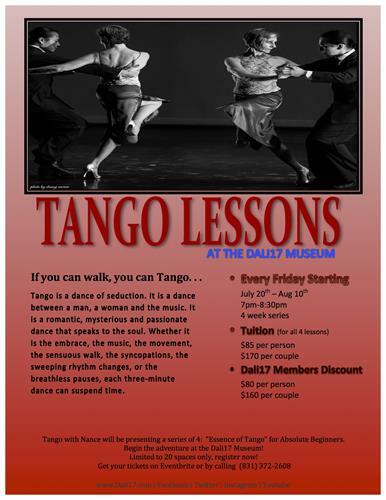 Nance will be presenting a series of 4: "Essence of Tango" for Absolute Beginners. Begin the adventure at the Dali17 Museum . . .
Dali17 Members Must call (831) 372-2608 for discounted Prices!